They have only played each other three times, but in four short months the New York derby has become one of football's great rivalries. 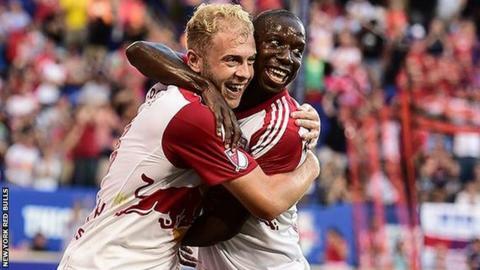 New York Red Bulls' 2-0 win over New York City in Major League Soccer on Sunday had all the hallmarks of a game between long-standing foes. Unfurled banners, bragging rights, social media one-upmanship and, as unsavoury as it was, even fighting in the streets. The arrival of New York City FC this season led many to think the Hudson derby would need a manufactured sense of drama. Think again. New York City, who are owned by Manchester City's parent company, have signed three experienced European players for their first season. Former Spain striker David Villa, 33, ex-England midfielder Frank Lampard, 37, and Italy midfielder Andrea Pirlo, 36, all joined the club amid much fanfare. But New York Red Bulls fans wasted no time in pointing out the highly regarded players are perhaps in the twilight of their careers. The Red Bulls, of course, have signed their share of experienced campaigners. France internationals Thierry Henry and Youri Djorkaeff, Australia's Tim Cahill and Colombia's Juan Pablo Angel are among those to have joined the club in their 30s. But that didn't stop their fans. With New York City playing in the sky blue of Manchester City, it seems fitting the Red Bulls play in Manchester United's traditional red. And there can be no doubt about who has the bragging rights in the early days of the New York derby. After goals from Bradley Wright-Phillips and Felipe Martins gave the Red Bulls victory, they tweeted: "Three matches. Three wins. New York is RED." The result came as no surprise to a confident group of supporters in the Red Bull Arena's South Ward section, where a banner reading "3 games, 9 points, #NYisRed" was unfurled before the game began. MOTD3: Who's our weekend star? What's on BBC Sport this week? City fans have queried why the Red Bulls have New York in their name, when their stadium is in Harrison, New Jersey. Red Bulls fans were happy to mock themselves - and their opponents. As well as this harmless jousting, the Hudson derby has taken on the murkier elements of some longer-standing rivalries. Associated Press journalist Rob Harris filmed a fight between opposition fans and tweeted: "Was outside a bar about 1 mile from Red Bulls Arena - and was all over in a couple of minutes. No running battles through the streets."